How do I get back red once mixed to make purple? How do I return each raindrop back to be part of the clouds? How do I squeeze each petal back into the bud? I heard Linda recite this poem at the Franschhoek Literary Festival and I was totally captivated. It is a beautiful poem and resonated hugely with me. I found it hard to contain my emotions, which is often what I love about poetry. I would love a copy of the other poem that Linda read at the festival : “If only” and I would like to thank Linda for her beautiful poetry. Linda Kaoma is a writer, poet and a B.Com graduate from the University of Cape Town. She has been with the Art Africa Centre for four years and project manager for Badilisha Poetry X-change for three years. 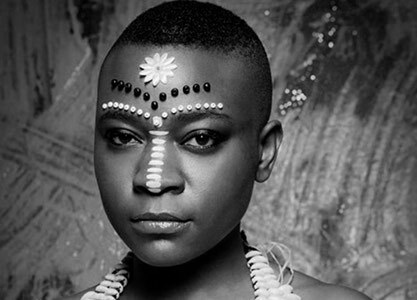 In 2013 she performed in Amsterdam at the Afro Vibes Festival alongside Dutch poet Babs Gons in a poetic production entitled “Becoming Another, Becoming you”. She is also the founder and editor of Unbranded Truth Online Magazine (www.unbrandedtruth.com), an online magazine that serves as a catalyst for self-acceptance and self-evolution. She has contributed to various publications and continues to freelance.